on the birth of their baby boy. 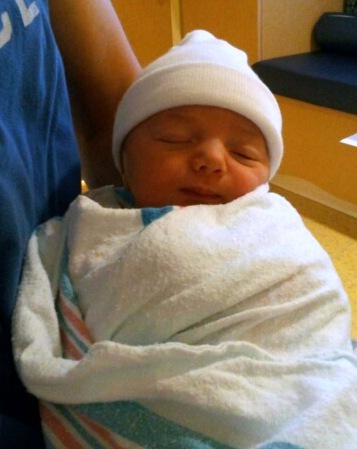 Mason Dominic was born on November 28, 2012 at 12:52 am. Mason weighed in at 7 lbs 1 oz. and is 20″ long. Kaitlyn and baby and proud new father Danny are doing fine. Best wishes to the happy grandparents and all their families on this wonderful new addition. He is beautiful. Congrats! Dominic and Mason were both on our name lists at some point. I can’t wait to meet him. I hope the new parents are getting some rest. I love that name! Dominic is one of the names I wanted if we had another boy. …And you’re a mason. Sorry, we can’t have another boy or girl, but I sure do love the ones we got! What a great pic! Mason is so handsome already! Congratulations to the new parents, the several-times grandparents and all us aunts, uncles and cousins! !